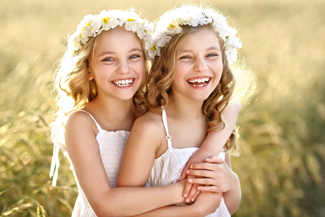 Will your child need braces in Kings Hill? Having straight teeth not only looks great but it makes it easier for people to keep them clean. Being able to easily clean the plaque off teeth makes them far less prone to tooth decay and gum disease and therefore they tend to last longer. These days, dentistry is all about helping you find ways to keep your natural teeth for life, and one way to do that is to make them easy to keep clean. So, if you’d like to give the gift of teeth for life to your child, you need to make sure they have straight teeth. Unfortunately, wearing braces in Kings Hill has tended to coincide with the onset of puberty, which is well known as the time when kids tend to suffer from the most excruciating self-consciousness. Having to suffer the taunts that teens can throw at each other can be a nightmare for many kids, especially in these times of cyber-bullying on social media. Wouldn’t it be great if your child could get their braces treatment out of the way before all that teen stuff sets in? Well, they can, if you bring them along to One Smile Oral Care. Here at One Smile Oral Care, our braces dentist is Yasmin George. She is a great believer in assessing children for braces in Kings Hill early. Early treatment can help the face develop properly. If teeth are crowded, having them straightened out can mean that your child develops a broad jaw, which is what is wanted. Yasmin George can assess children for braces in Kings Hill from as early as 5 years old, thanks to advances in dental technology which mean that we can now look inside the jawbone to see how the adult teeth are lining up behind the baby teeth. Bring your child along for an assessment before they are 7 years old, and we can make sure they get the treatment they need to get a properly developed face and jaw. Changing the shape of the jaw can only happen when your child is under the age of 18, before the bone sets hard. The earlier this treatment is carried out, the more plastic and malleable the jawbone is. This entry was posted in Braces on 26th December, 2018 by One Smile Oral Care.